Swarm behaviour, or swarming, is a collective behaviour exhibited by animals of similar size which aggregate together, perhaps milling about the same spot or perhaps moving en masse or migrating in some direction. 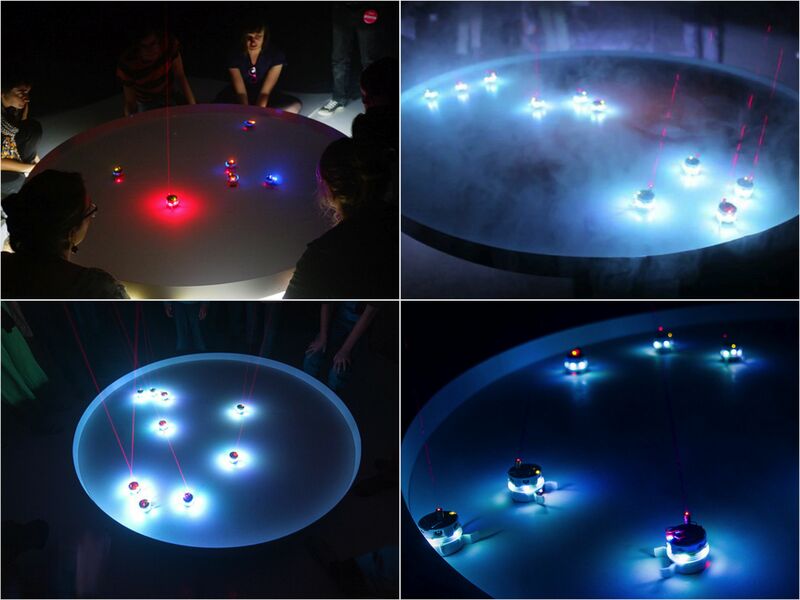 UMwelt-VIRUtopia is a micro robotic swarm that builds up a dialogue with space, sound, light and the audience. The project is a playful critique on post-modernism and technocracy, similar to Jacques Tati’s ‘Playtime’ was a critique on Modernism. The project questions swarming behaviour, patterns and emergence (human, animal, robotic). Can we change the swarm architecture through interaction? Can we ‘break’ the patterns as an audience? Can we reprogram space, behaviours, patterns, …, to create a new experience? UMwelt-VIRUtopia consists of a minimum of 23 robots equipped with laser beam class 2 technology mounted on top of each robot. Swarming patterns emerge and a choreography of light, sound and space unfolds in front of the audience. 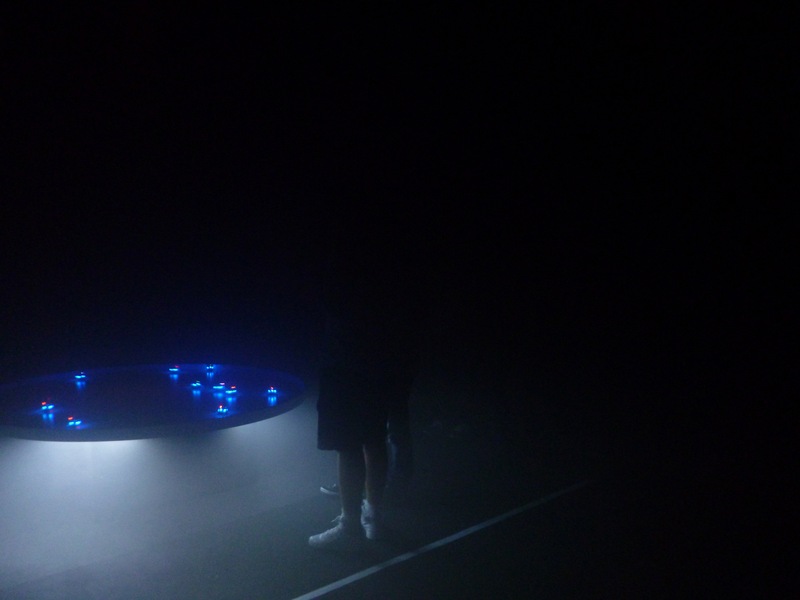 The installation space is filled with artificial smoke evoking a dreamscape. The smoke articulates the visibility of the laser beams. 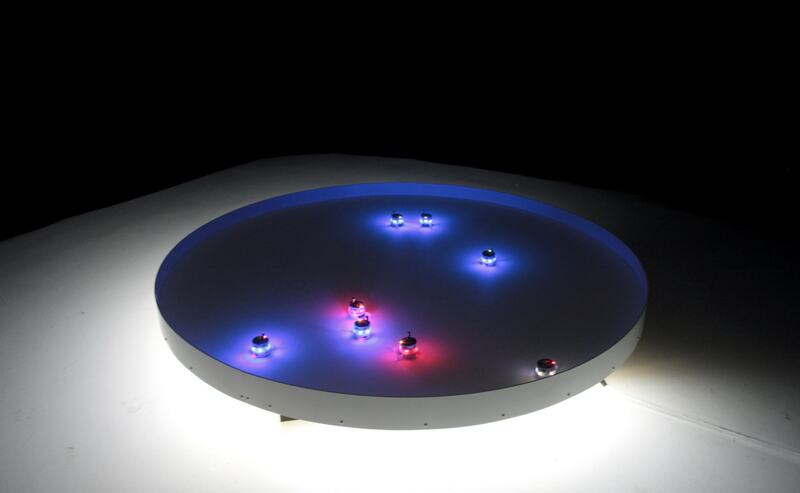 Swarm robotics is an approach to robotics that emphasizes many simple robots instead of a single complex robot. A robot swarm has much in common with an ant colony or swarm of bees. No individual in the group is very intelligent or complex, but combined, they can perform difficult tasks. 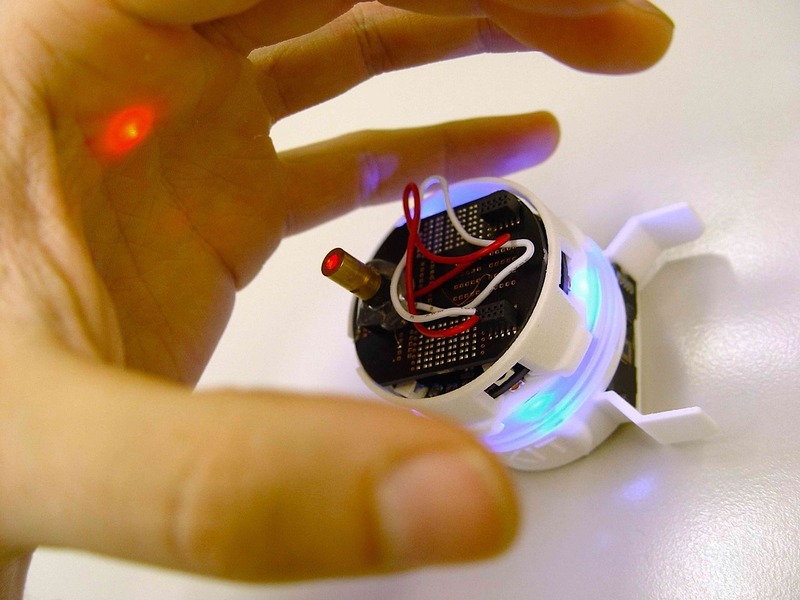 One use that researchers have demonstrated for swarm robotics is mapping. A single robot would constantly need to keep track of its location, remember where it had been and figure out how to avoid obstacles while still exploring the entire area. A swarm of robots could be programmed simply to avoid obstacles while keeping in contact with other members of the swarm. The data from all of the robots in the swarm is then combined into a single map. The problems of organizing a swarm haven’t kept people from imagining what swarm robotics could offer some day. Some scientists envision a swarm of very small microbots being used to explore other planets. Other proposed uses include search-and-rescue missions, mining and even firefighting. When used with nanobots — microscopic-size robots — swarm robotics could even be used in human medicine.